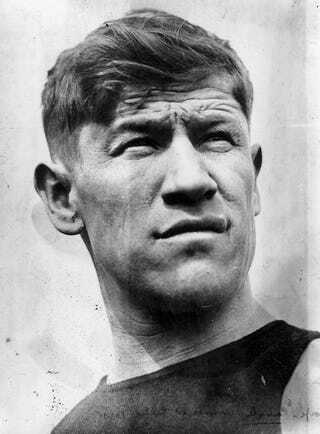 The Washington Post has a great profile on Jim Thorpe and highlights the legal battle being waged over his burial. The story centers on his third wife, Patsy, who sounds like a real peach. She burst into a Native American funeral rite with a hearse and some cops and took her husband's body. Evidently not a fan of Thorpe's Native American heritage—and eager to cash in on his notoriety—Patsy took her husband's corpse on some twisted circus-like trek across the country hoping to find a proper resting place. And proper compensation. She found that in Pennsylvania in what amounted to the Hatfields and McCoys of towns. Patsy was able to get the feuding towns of Mauch Chunk and East Mauch Chunk to unite under one name—Jim Thorpe—in return for some cash and a memorial. Thorpe's remains remain there to this day in a red marble mausoleum. The family (the sons, really) have spent the better part of their adult lives trying to return Thorpe's body to Oklahoma, where they believe is his proper resting place. Thanks to new legislation, and a lawsuit, they may be successful. In 1990, Congress enacted the Native American Graves Protection and Repatriation Act, a sweeping bid to redress more than 150 years of abuse. It is designed to force museums to return human remains and sacred artifacts to their tribes of origin. Sherry Hutt, national program manager for the act, says museums are not required to file annual reports of returns, so there is no comprehensive number of how many bodies have been transferred. What is known are the cases voluntarily reported: In the 22 years since the law was passed, the remains of 41,000 Native Americans have either been returned to their tribes or have been identified as eligible to be returned. The Thorpe family is attempting to force the return of their father's remains by claiming the memorial in Jim Thorpe is a museum. Right now, a federal judge agrees with them, however he has not yet ruled on whether a "right of posession" exception available in the law applies to the town. The whole profile is really interesting and well worth a read.